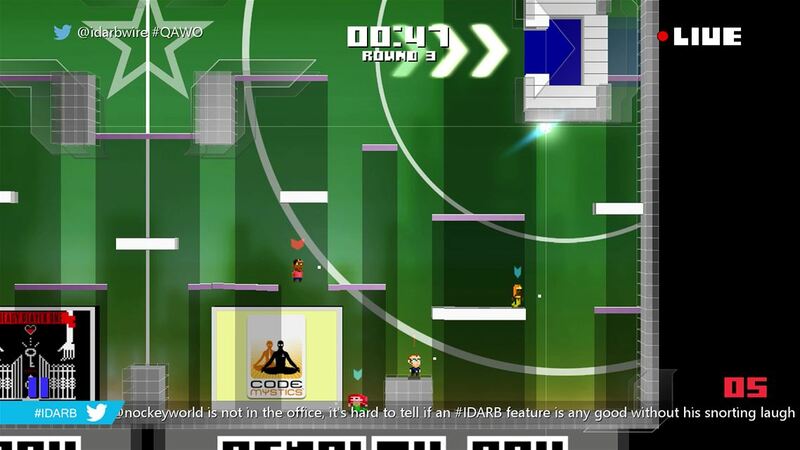 #IDARB is a 2D platformer mixed with soccer, hockey, basketball, and a little Super Smash Bros thrown in for good measure, and it is one of the must fun and addictive local multiplayer games on Xbox One. It is crazy in all the best ways and well worth a look. See our review for details. 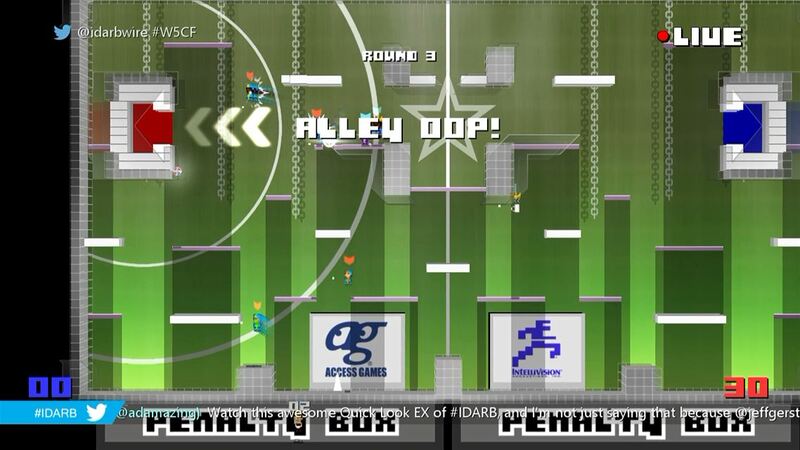 #IDARB is a multiplayer 2D sports game where teams try to score points by getting the ball into the opposing team’s goal. The basics of the game are that taking shots from further away, and by connecting multiple passes between teammates before shooting, the goals are worth more points. The game is playable and pretty fun with just two-players one-on-one, but really picks up in 2-on-2, 3-on-3, and 4-on-4 matches where teamwork and strategy can really pay off. There is a single-player “story” mode that lets you play with and against A.I. but it just isn’t nearly as fun as playing with other real people. You’re far better off playing in multiplayer either locally or online with up to 8 people. One thing worth noting is that online play is limited to how many local players you have, so if you’re by yourself you can only play 1v1, or if there are two local players you can only play 2v2. Its kind of strange that you can’t join teams of other players. Gameplay in #IDARB is ridiculously fun because the controls are really intuitive and responsive. Running around and jumping from platform to platform, throwing the ball, and sending out a pulse to interrupt opposing players are all just a super simple button press away. The game also just plain feels good to play. “Responsive” really is the perfect word to describe it. You’re always in full control, which makes skillful play very satisfying to pull off. The game is fun with just two players, but get a full 4v4 game going and #IDARB gets really, really nuts. An interesting feature of #IDARB is that the game has a number of customization options. You can make your own sprite-based characters and even make custom background music, all in the game itself. You can share your creations and download other players’, which is awesome. The game also comes with a huge number of pre-made sprites with characters from Telltale Games titles, Halo, Rareware, Divekick, and much more. The game also has extensive social media integration and you can even see a live Twitter feed of tweets about the game scroll across the bottom of the screen as you play. There are even things called “hash bombs” where random passers by can influence your game based on the hashtags they use. It is totally nuts. There is even a Twitch-focused fantasy gambling mode where you and your Twitch viewers watch two teams of A.I. players battle it out while dropping hash bombs on them. The presentation is pretty appealing in #IDARB because it chose a theme – blocky oldschool sprites – and stuck with it. The arenas and characters look great and it is always easy to tell what is going on – until you have 8 people going at it, at least. As much as we genuinely love #IDARB, the asking price is a little steep unless you’re planning on playing a ton of multiplayer. 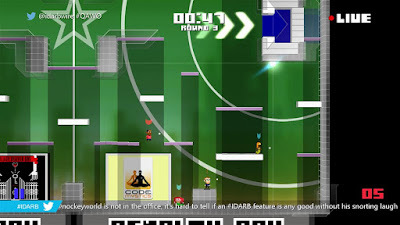 Originally offered as a free Games With Gold title, #IDARB will now set you back $15 to play it. It is definitely fun, but $15 is a lot for something that is multiplayer-only and is such a simple concept. I’d suggest waiting for a sale, but if you have friends you know will be around to play it with a lot, paying full price isn’t too bad.